It was a leisurely day for us. We exercised and then enjoyed massages on the beach. When walking through town, I get a kick out of the pharmacy signs that are always posted in front of the store listing their most popular drugs....Viagra is always in the top billings. 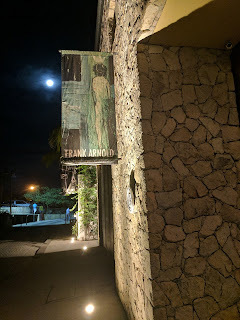 In the evening we walked into the old town for the weekly Art Walk where artists and galleries offer tequila and wine in their stores as you check out their creations. Locals and tourists pack the streets for this event. Music immediately drew us to the central area where we watched a few different groups of folk dancers. Of course we had to check out many of the original, fine quality, handcrafted jewelry shops. While sipping on wine, Cheryl bought a stunning aquamarine ring at the talented Johnathon Sanchez's shop. Especially enjoyable was the Frank Arnold Gallery where we were given the choice of either unique pomegranate or almond tequila. The gallery is part of the artists house which we were invited to tour. It was a decorators dream with its stunning architecture, beautiful chandeliers and unique detailing. I enjoyed the house just as much as the art work. The artist and his wife were both there. This is a definite must, if you do the art walk. I also enjoyed the Ivan Guaderrama interactive art gallery on A. Obregon. This gallery was so much fun. Different things would happen when you touch certain parts of the artwork. For example, there was a painting of a piano that actually played when you touch the keys or bulbs that lit up on a piece of art when you touched the heat sessor. 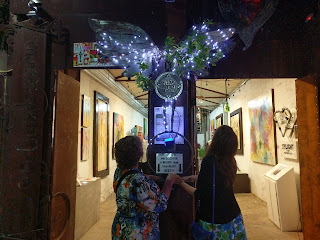 There were also sounds or lights that would come on when you held hands with someone and both touched the artwork at the same time. There was even artwork that animated with the use of an app on your cell phone. Very original, very innovative and very fun. With tired and sore feet, we made our way back to the condo at the end of the night.